Let’s turn back the clock. The first time I entered Hotel New York in Rotterdam was back in 1994. I was a student of Japanese language at the Erasmus University. Those days Hotel New York was just recently opened after the building was abandoned for more than 20 years! The building with its two green towers plays an important role in Dutch marine history and it always had (and has) a special place in the hearts of the people of Rotterdam. When I stepped into the building back in 1994 I was amazed by the marine artifacts, the historic atmosphere and the superb location on the Wilhelminapier. I went back many times to visit for dinner or just a coffee. Honestly Hotel New York always feels like coming home when we are back in Rotterdam. 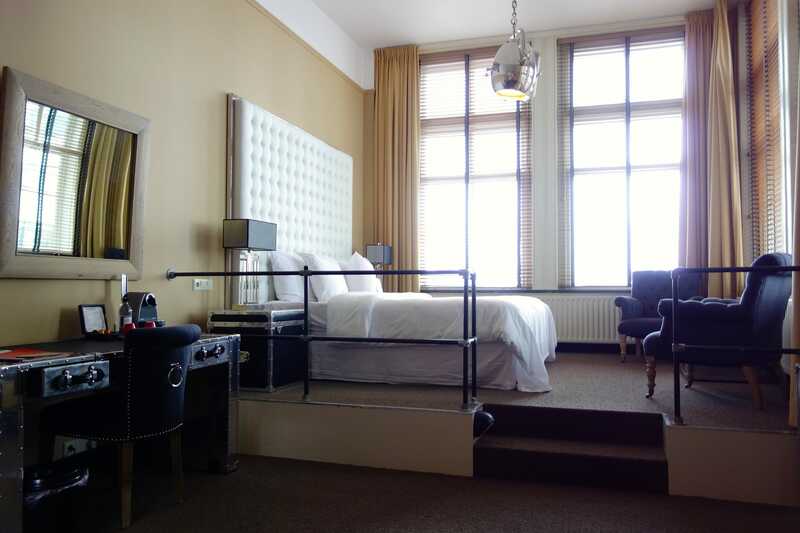 Rotterdam is a sparkling city where Hotel New York is definitely the place to be. This year, 20 years after my first visit, we finally were able to spend two nights! Expectations were high, so let’s see if they were all met. Hotel New York has a long history being the former headquarters of the Holland-America Line (HAL), owner of a direct steam service to America. During the 19th and 20th century thousands of Europeans left for the ‘Promised Land’: America. It was an attempt to escape poverty and religious repression. The transatlantic trip took them around a week. A trip full of hope, but still an extremely tough one with sometimes unbearable conditions. The 1960s marked the beginning of a decline in passengers as competition by airplanes became too strong. The HAL headquarters was built between 1901-1917. The building was closed in 1970 when the headquarters moved to Seattle. It was put for sale in 1984 and abandoned until early 1990s…. Some Dutch investors believed in the place and decided to create a hotel with a large cafe-restaurant! In 1992 it opened as Hotel New York on a still empty pier (Wilhelmina Pier). That has certainly changed where the Wilhelmina Pier now hosts some of the highest buildings of the Netherlands. It’s for sure one of the architectural frontpieces of the Netherlands. Hotel New York is a landmark for the city of Rotterdam. Once it solely stood proud on the banks of the river Meuse (Maas), waving goodbye to passengers on the huge steamliners. Nowadays, although surrounded by immense towers with modern architecture, it still stands strong. The character of the hotel easily beats the ones of the giant buildings around her. Hotel New York is still referred to as ‘The Grand Old Lady’. It’s also the local place to go for a drink, lunch or dinner. The views on the city are fabulous, especially when night falls. From Hotel New York you can see the contours of the port of Rotterdam, the 3rd largest in the world after Shanghai and Singapore. It’s massive, and a boat trip exploring the port is really worth the money. Hotel New York offers 72 rooms, most of them offering a view of the river. It’s always busy in the hotel’s cafe and even when you head for the breakfast buffet you will see locals who were up for an early walk enjoying a coffee in the restaurant. Room rates (excluding breakfast buffet) are between Euro 99 for a regular patio room to Euro 270 for a loft with roof terrace. One of the most popular rooms are the Tower rooms. If you want to book them for the weekend, you might need to reserve it 6-9 months in advance! Hotel New York and its surroundings are special to the city of Rotterdam. During check-in I could imagine the reception paying a bit more attention to this (especially for foreigners). For example informing visitors about the history of the building or offering tips for travelers (like the nearby watertaxi, the famous barbershop in the basement or even the temporary art exhibitions in the close-by Fenixloods). But again, the style, atmosphere and location of the hotel is unique and we really love it. Click here to check availability and prices. If you want to go for the full marine experience, you might consider a combination with or visit to the steamliner SS Rotterdam. Rotterdam partners invited us to attend the City Racing and offered us a room for two nights in Hotel New York. Don’t forget to check out my recent post about Things to do with kids in Rotterdam! If you plan to visit Rotterdam, consider buying the Rotterdam Welcome Card (RWC). It offers discounts of 25% and more at 50 attractions, museums, restaurants and places of entertainment in Rotterdam and 1, 2 or 3 days of unlimited travel with RET metro, tram and bus. You can order the RWC already ahead of your visit. Keep an eye on the Rotterdam travel website to see what is going on.